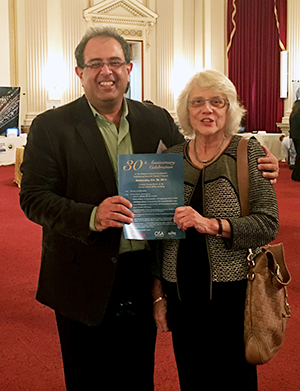 ISR Director Reza Ghodssi with original NSF ERC Director Lynn Preston at the 30th anniversary celebration of NSF's ERC program. As one of the original six NSF Engineering Research Centers, the Institute for Systems Research was invited to share its experiences and best practices at the National Science Foundation’s 30th Anniversary ERC Celebration, Oct. 27–28. ISR Director Reza Ghodssi (ECE/ISR), along with Rao Tummala of the Georgia Tech Microsystems Packaging Research Center (an ERC established in 1994), gave presentations before a group of current and newly graduated ERC directors and NSF officials. They each spoke about graduating from the ERC program and steering a healthy course afterwards. ISR's information was based on the presentation given to NSF at ISR’s 2010 review, along with reflections on the institute’s experiences since that time. Ghodssi also participated in a two-hour panel featuring all the graduated ERC directors, where he spoke further about how ISR has survived and thrived for three decades. The final event was NSF’s ERC 30th Anniversary reception in the Common Caucus Room of the Cannon House Office Building on Capitol Hill, hosted by Rep. Randy Hultgren (R-Ill.). This reception featured NSF Director Dr. France A. Córdova; Pramod P. Khargonekar, the NSF Assistant Director for the Directorate of Engineering (who gave a distinguished lecture here at Maryland last month); and James Jefferies, the 2015 IEEE president. Lynn Preston, the original ERC director at NSF, was also in attendance, along with many others, including members of Congress.